Leive, Rezia and I went to the Creation Museum on June 2, 2007, just five days after it opened to the general public. Because it’s on the beltway going around Cincinnati, putting it several miles west of the city and its airport, we ended up driving just over 90 miles to get there. Finding it was no problem, since I saw a steel stegosaurus skeleton next to the building, even before we got off the beltway. The turnout was good, an estimated 800 guests so far for the day by the time we arrived, around noon. It looked like we got the last paved parking space. There’s also a combination playground/nature walk outside, but it wasn’t finished yet. For an extra $5, you can also get a ticket to the planetarium show they have on the majesty of God’s creation. Both Leive and I heartily recommend it; through the magic of computer animation, they fly you far enough away from earth to see the entire universe, then bring you back again. Note: To keep the stuff in the left-hand margin of this blog, your browser will cut off the right edge of each picture. Evidently horizontal scrolling is not permitted here. Click on any picture to see the whole thing. Since we arrived at lunchtime, we ate first, in the restaurant they call Noah’s Cafe. The place had a tropical feel to it, with plastic bougainvilleas covering the walls and ceiling. 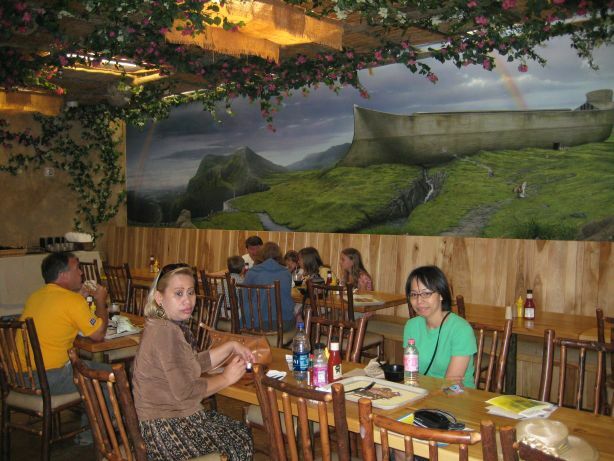 Note also the beautiful mural of Noah’s Ark, on the wall behind Leive and Rezia. Creation, Corruption, Catastrophe, Confusion, Christ, Cross and Consumation. Other cases featured live finches, arrow-poison frogs, etc., showing the diversity God put into nature. 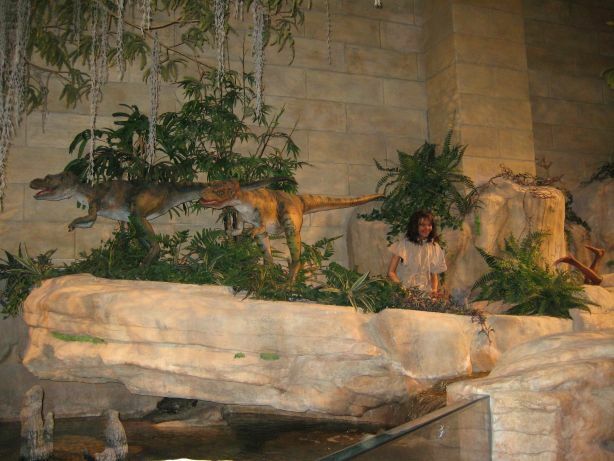 Here, on a ledge over a fish tank, also near the main exhibit entrance, are two of Adam and Eve’s kids (the legs of the second are on the far right), playing in a stream with two dinosaur friends. 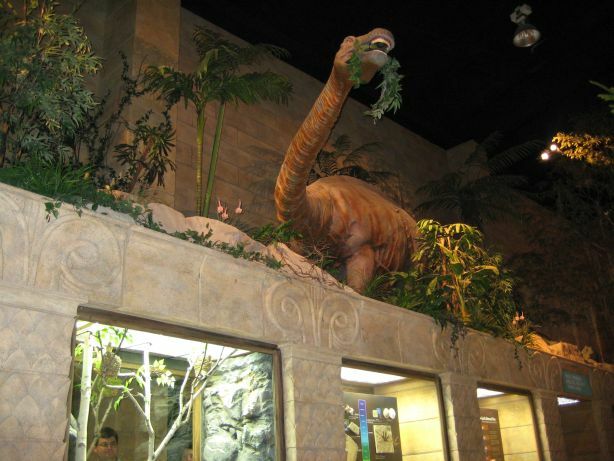 On another ledge above the previously mentioned glass cases, an audioanimatronic sauropod dinosaur enjoys a snack. I understand the fellow who did the King Kong and Jaws attractions at Universal Studios also made many of the robots for this museum. 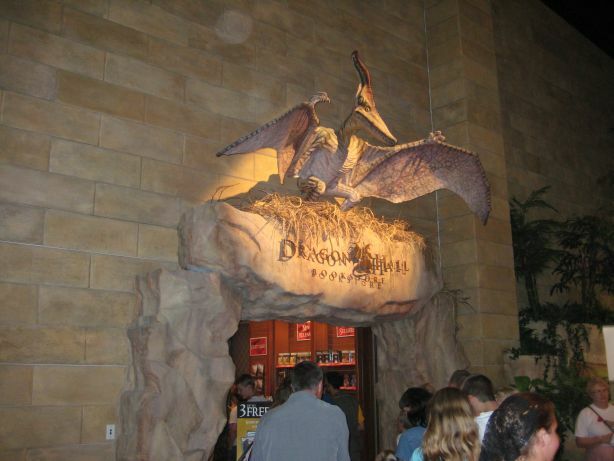 A noisy pterodactyl guarded the entrance to the Dragon Hall Bookstore. Unlike the rest of the museum, the shop had something of a medieval theme, with heraldry and pictures of St. George & the Dragon on the walls. 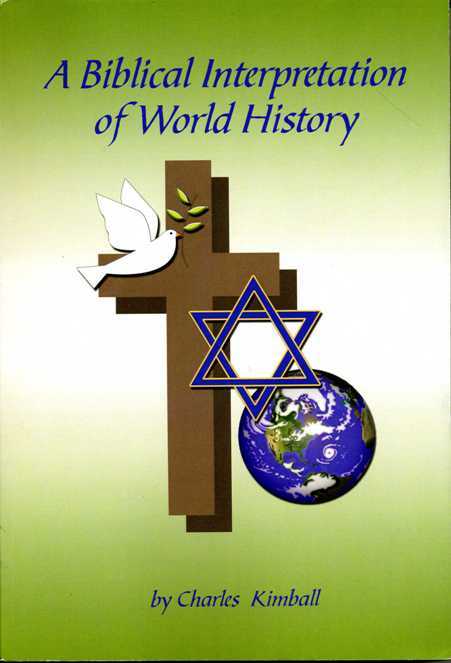 I was pleased to see that they sell copies of Archbishop Ussher’s “The Annals of the World” in there; remember when I told how a map I drew turned up on the companion CD? 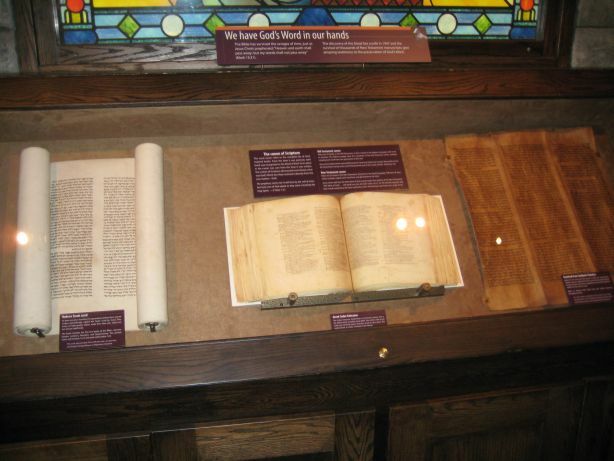 Two Torah scrolls surround a restored copy of a fourth-century Bible, written in Greek. The part of the Torah on the right was rescued from Saddam Hussein’s Iraq, just a few years ago. A few exhibits weren’t finished when the museum opened, and somebody with a sense of humor put signs on them, saying “This space is still evolving,” LOL. 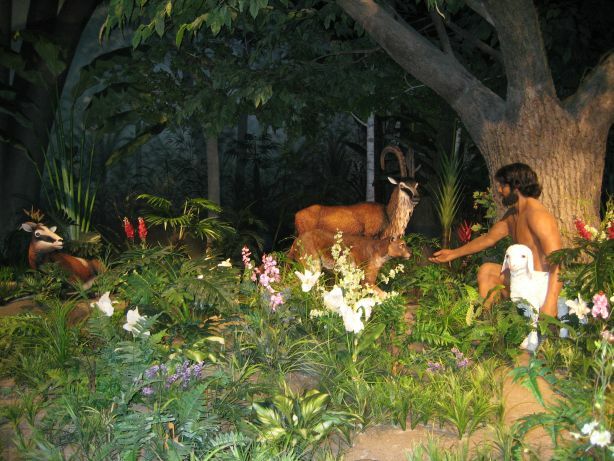 A life-sized display of Adam naming the animals. You have to look up to see this full-scale replica of the Tree of Life. They also had a talking serpent in a glass case; no Tree of Knowledge of Good & Evil, though. 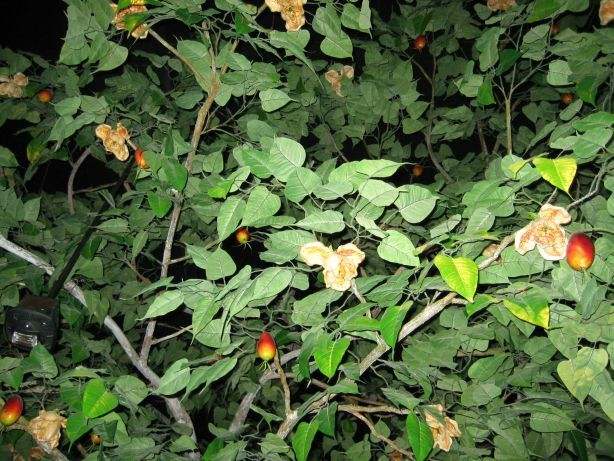 However, the fruit does looks like a mango, with blossoms resembling magnolias. 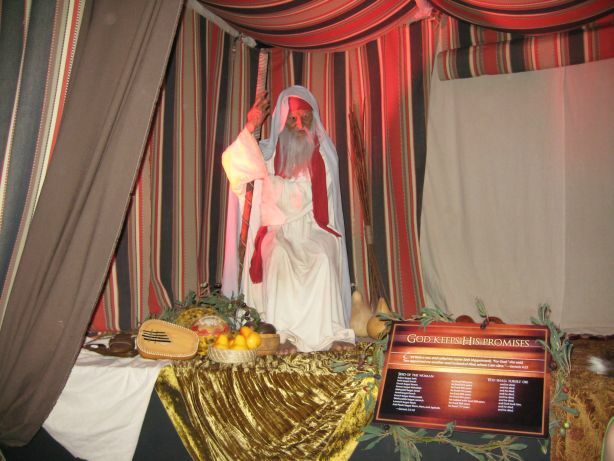 Here an audioanimatronic Methuselah tells us what his grandson Noah is up to, and how God promised he would live long enough to see it completed. 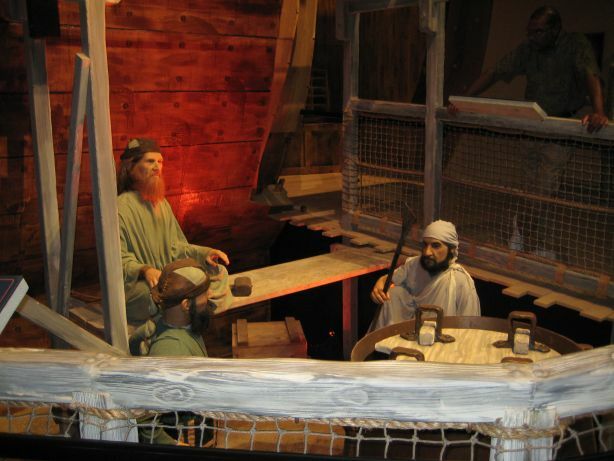 Some skeptical workers are commenting on how they haven’t seen a drop of rain since Noah hired them to build the Ark. Still most people are willing to work for a crazy boss, if the pay is good. Too bad they didn’t consider the fringe benefits, especially coming on board when the project was finished. This movie on the Tower of Babel was flanked by four fountains and two Babylonian-style cherubim (winged bulls to guard city gates). 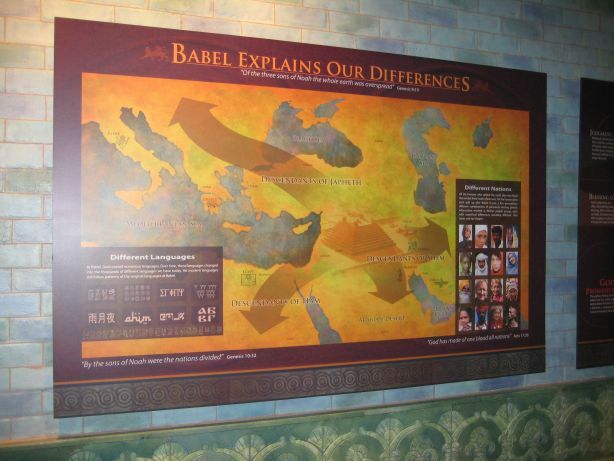 After Babel was a map on one of my favorite topics, the Table of Nations (Genesis 10). Overall, the three of us enjoyed ourselves. The exhibit does much to strengthen your faith if you’re already a creationist, so I invite believers come and visit for that reason alone. Here they can see people and things from the first eleven chapters of Genesis, that they could only imagine before. I explained to Leive that if you go to the Smithsonian, the American Museum of Natural History, or the Field Museum of Natural History in Chicago, you will see plenty of dinosaur skeletons, but it’s all taught from an evolutionary perspective; they’ll tell you how old they think each dinosaur is, for a start. When I visited the Field Museum in 2000, I remember how after every skeleton they had a model or diorama to show what the animal looked like when it was alive. And most of the dioramas showed dinosaurs killing each other in spectacular ways; gory fight scenes, meat-eaters ambushing mother dinosaurs on their nests, etc. Honestly, it wouldn’t surprise me if Joe Bob Briggs, a movie critic who rates films by how much violence they show (the more the better! 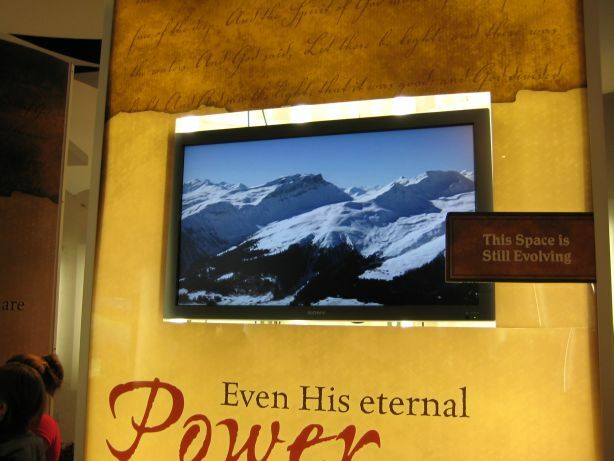 ), designed those displays. Now we finally have a place that gives our version of the story equal time. However, I didn’t see too many things that could change the mind of an evolutionist. 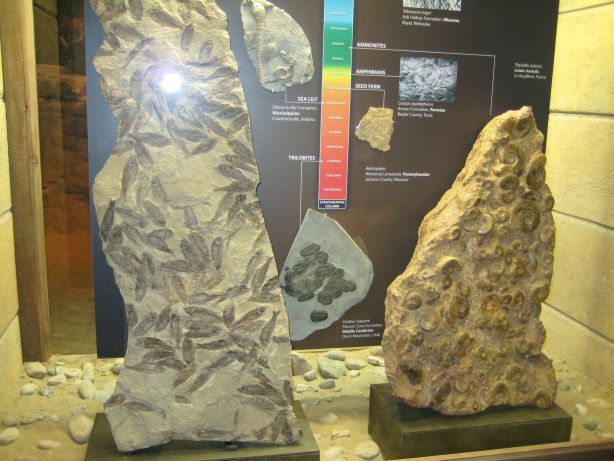 For example, the exhibit designers could have explained the astronomical odds against things evolving by chance, why radiocarbon dating can’t be trusted, or why most theories on the origins of life are absurd. They didn’t even explain why there’s no such thing as a “missing link” among the cavemen we have found so far, though they had a replica of Lucy, one of the most famous missing link fossils. 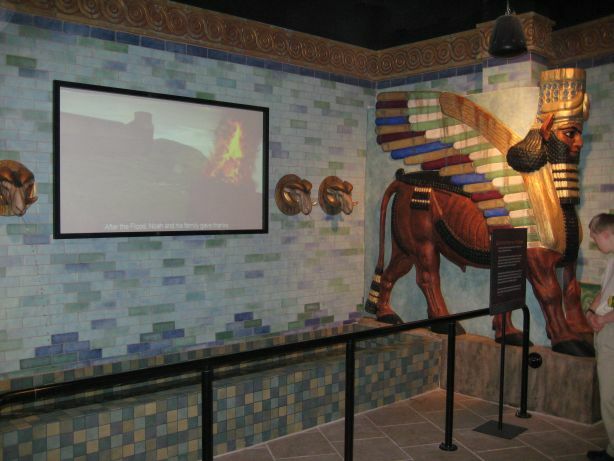 If I was designing the museum, I would have allowed more room to argue and demonstrate why creation/intelligent design makes more sense than evolution. Maybe that will go in at a latter date, once they’re comfortable running the robot dinosaurs they have now. Great Photos! Thanks so much for sharing these! I wish I could have gone with you. Hope to visit the museum sometime soon, but it won’t be until August or September this year, if at all. I am too busy right now with major upcoming trade shows, and books to finish. Hope to have some free time in the autumn, but God may have other plans! Fair tickets, a gift basket, and a free dinner. Thanks for the pictures of the museum. That was a blast uncle Charles!!!! I love it! :’) Loved the Joe Bob Briggs reference!